What metaphor do you use to describe life? Specifically your life. Brian Greytak: Life’s a beach. Then you’re shark bait. Jaz Goven: Just do it anyway!!! So ask yourself whether your metaphor is useful to you, right now and in the long term. Is it getting you closer to the feelings, experiences and results you want in your life? Is it driven by love or fear? Does it feel light and playful, or heavy and joyless? If it’s not working well for you, do you want to hang onto it and let it control you forever, or are you willing to let it go and choose a more useful one? Please leave a comment about your metaphor and how it serves you (or not). And if it’s not serving you well, what do you plan to do about that? 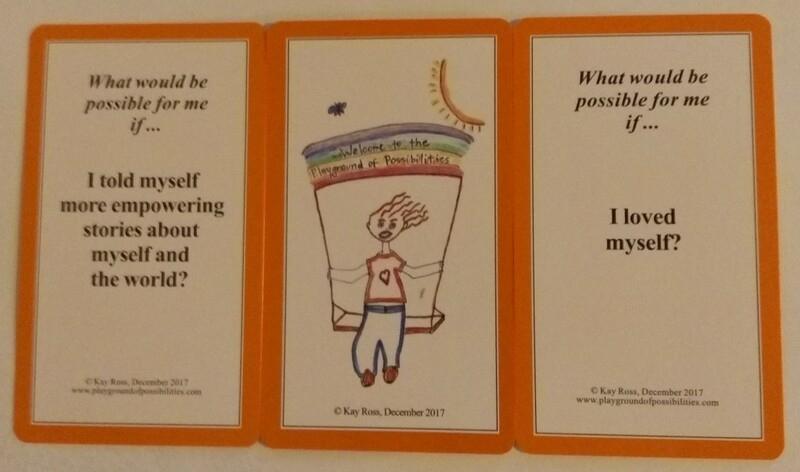 To prompt your thinking, below are two questions for you to ask yourself, from my “The Playground of Possibilities” card deck. See the Card Deck page here on this site for more info, and to buy a deck (or several decks, to share with your friends, family members, clients, students…), please go to the Shop page.